Everyone who has a kid agrees that strollers and prams are a gift to humankind. You might be a parent, but you are not Superman who can carry around a child all day long without getting tired. Therefore, we need strollers because holding a child for a long period of time might strain your arms and cause you unnecessary pain. We cannot always hold our little one in our arms. Therefore, we turn to baby carrying gadgets. However, bear in mind that not all strollers are same. Some are built for home use while other strollers in the market are made for rough use. So, if you want to keep yourself active and enjoy the outdoors with your kids, then baby jogger strollers or even double jogging strollers are just the thing you need. 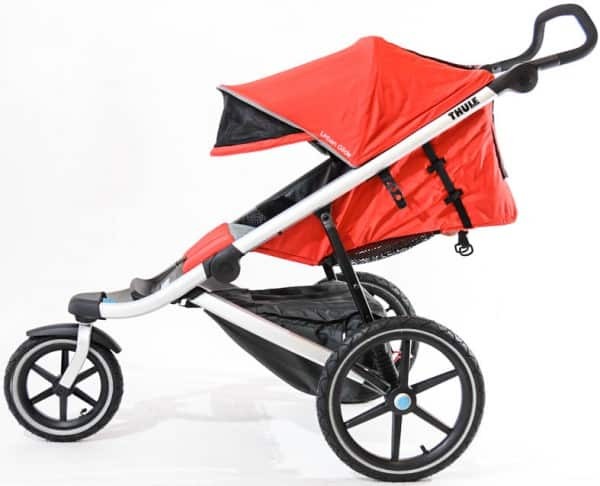 Here, we have reviewed the top five best running and jogging strollers that keep you and your baby active, occupied, and happy. With more than 900 positive reviews on Amazon, this all-terrain stroller has made it to the top of our list. This durable metal stroller with its lightweight steel frame construction weighs just 27 lb but can easily carry a child weighing 55 lb. 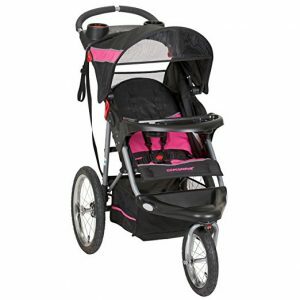 This baby jogger features large bicycle tires and a front swivel wheel that provides smooth mobility. Let’s say you are out jogging in a park with your child sitting in the stroller, but the front wheel keeps swiveling left and right. Eventually, you will get tired of controlling the stroller. Don’t worry—the Baby Trend Expedition Jogger Stroller has got you covered. Now, the front wheel of your infant’s stroller can be locked in place for jogging and unlocked for maneuvering the pram at low speed. This all-terrain stroller’s wheels roll effortlessly over all surfaces. It comes with a convenient parent tray that has a capacity to hold two sippy cups, along with that it has a reclining padded seat with a five-point harness and a tether strap that ensures your young one’s safety. Moreover, this stroller has a large canopy that shelters your kid from the scorching sun and windy weather. It also has a storage basket to carry your child’s toys. Designed and installed with the latest innovative features, this baby stroller is surely worth your money. It is a space saving product with its easy two-step folding lightweight frame construction. Like many strollers, this one comes with a snack tray and you can also install an infant car seat adapter in it. What makes this pram ideal is the ultra-padded seat because your child’s comfort should always come first. The seat has a reclining option as well that provides necessary support for a sleeping infant. 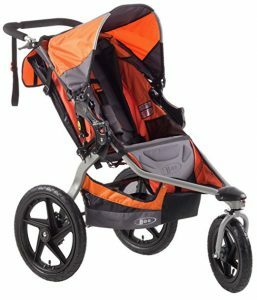 This stroller comes in all different colors including bright orange color which makes it easily identifiable if—God forbid—you lose track of the carrier. It is suitable for children of eight weeks (plus), though its capacity is slightly more than the previous product (i.e. this stroller can hold up to seventy pounds of weight) without the additional weight of stored items or infant carrier. Moreover, its suspension system ensures a smooth ride for your little one with shock absorbers that add comfort and make this product reliable. For safety measures, this stroller has a five-point padded harness that comes with fasteners which can be easily tightened by easy-to-pull rings. Hence, this product keeps your child comfy and safe at the same time. Our third pick is none other than Amazon’s no. 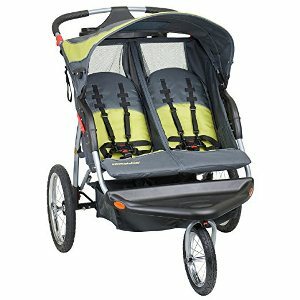 1 best selling double jogging stroller. If you have twins or children who are inseparable, then don’t think twice about buying this dual-seat pram or double stroller. There is no doubt; it will make your job as a parent 100 times easier. Each of the two seats can hold up to 50 lb of weight, so now you won’t have to carry one child while the other is lounging in the carrier. The tires of the stroller comprise rubber pneumatic. It also comes with a rear brake system which is activated by foot, providing you with the safety control. It is quick compact and easy to fold, which makes this product a perfect companion for parents who like to take their kids along with them for a little jog in the park. This single jogger stroller is ideal and reliable for handling the uneven ground with its broad tread tires. 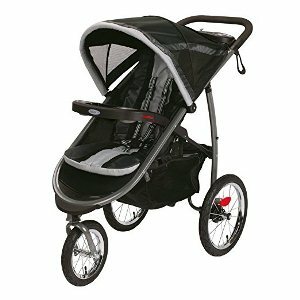 Its aluminum frame is light but provides you with easy handling of the stroller. For your convenience, it also has a molded food tray which lets your kid enjoy their snacks during the smooth ride. 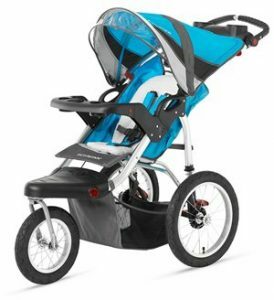 As its name suggests, the Single Jogger has a 12-inch long front swivel wheel that controls and stabilizes the stroller, while jogging, by locking the wheel forward. Moreover, it has two 16-inch long rear wheels that add safety to the stroller’s design by maintaining a good distance between your young one and the ground. In addition, this state-of-the-art stroller will keep your kid entertained all the time with its built-in mp3 player. So, spend your money wisely by buying the Schwinn Turismo Swivel Jogger—you will thank us for introducing you to it. Just because this product is fifth on our list, doesn’t mean it is in any way inferior or lacking from the other four strollers. This one just might become your favorite with its glitch-free performance. The high-quality, air-filled rubber tires prevent the stroller from bouncing on rough surfaces. It is a must-have for fitness loving parents who search for baby products that keep up with their active lifestyle. It has a nifty cell phone holder clip as well as two cup holders built-in just for mom and dad. Plus, if you live in a sunny area the large canopy will help you shade your kids from the bright sun during morning walks. Yes, this stroller is lightweight, but it is nonetheless sturdy, durable, and hard-wearing.